We were super lucky to be finalists in the Mad Blog awards again this year. Not only is it amazing to be recognised by your peers, but it’s also a really great opportunity to enjoy a date with my wife in London. We don’t get to London as much as we’d like and love to dress up fancy and sample some super foods whilst meeting old and new blogging friends. With the Mad Blog Awards falling on the same day as the Rugby World Cup opening game, we set off early to enjoy a cheeky lunch at Five Guys and a little shopping. With both Clara and I working full time, both studying and daily vlogs taking up our evening’s, it was so nice to get out of the house and enjoy some time together as a couple. Five Guys was as delicious as ever and the shops provided us with the finishing touches to our outfits. We also ended up walking almost 7 miles by the end of the day due to not having any cash for a taxi back to the Mad Blog Awards hotel. After a quick change in the hotel toilets and some fancy makeup application by the Powder Puff Girls (C, not me), I was soon taking advantage of the free wine and greeting Dr Ranj with the friendliest of hugs. It was also really lovely to be able to invite one of our besties (Kara from Innocent Charm Chats) as our plus one this year. Kara was at the first Mad Blog Awards we ever attended, so we were happy to be spending the evening with her. The welcome drinks reception seemed to fly by in a blur of photo-booth shots, Micro Scooters graffiti wall fun and more free wine. It was soon time for dinner, which was very tasty and over far too fast. I had promised to Periscope the awards for those following the night on social media and was quite impressed with the amount of viewers who tuned in. Oh how I love modern technology. Dr Ranj was hilarious as always and ever so slightly naughty, which made for a very entertaining award show. It was lovely to see so many new faces on the podium and several of our faves, taking home awards. In no time at all it was our category and to be honest both Clara and I were just happy to make it to the finals and appreciated how tough our competition was. We were super happy to see the lovely Jenny from Let’s stalk Mommy win our category, please do go check out her lovely blog. More wine, a scooter race against Flea, a drunk dance off with Dr Ranj and we were soon back in the car and heading back to Dorset. I was a little worse for wear, but Clara had stayed off the wine and made sure we got back safely. It really was a lovely evening, that was everything we needed it to be. Not only did we get to see someone we adore win a well deserved award (Hayley), we also got to enjoy each others company, child free. 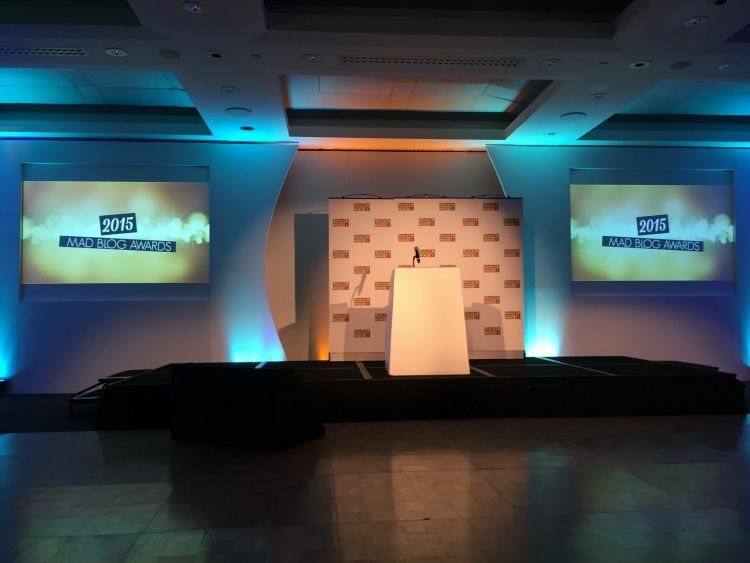 A huge thank you to the Mad Blog Awards team for putting on such a fab event and an even bigger thanks to those who helped get us to the finals, you all rock!